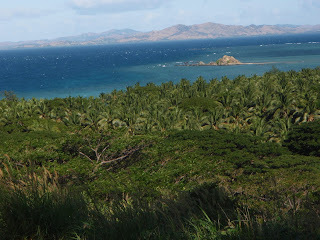 In April, we seriously questioned coming to Fiji. The military head of the country postponed elections until 2014. The country’s Supreme Court was dismissed after ruling the military coup was unconstitutional. The authority to license lawyers was taken from the bar association and handed to the government so it could put an end to effective representation of political dissidents, according to NZ newspapers. Fiji has been in an ongoing state of political stress for over 25 years. The underlying issue is race. The first thing we were told in Fiji, from the health inspector who came aboard wearing a mask and gloves to protect against H1N1 virus, was “There are two races in Fiji – Fijians and Indians. He,” pointing to her colleague,“ is Indian. I am Fijian.” The population is split about 50 -50. Employment seems to follow that pattern. Government offices and businesses, small and large, have both Indians and Fijians working side by side. We asked, it is a government mandate? The response, was no, it is good business. From what we could tell, housing is somewhat segregated (there are Indian villages where they fly red prayer flags). There did not appear to be any intermarriage. Indo-Fijians started coming here around 1870 to work in the sugar cane fields as indentured servants. Though they are restricted from owning land, the Indo-Fijians are successful farmers, business people and professionals. For years, pro-Fijian governments have made life difficult for Indians, and many have left the country. Currently the government, which controls much of the land in trust for ethnic Fijians, is not renewing ten year leases to Indian farmers. We heard a few dissents in Suva. “You can’t say anything for fear of being put in prison,” said one Indian cabdriver. The newspapers are silent except for the occasional press release from the government. A distinguished Fijian who had served in a previous government and at UN Headquarters said, “It will have to run its course. The people will not be happy when unemployment rises when the rest of the world stops visiting and giving aid due to Fiji’s non-compliance with aid conditions. The truth, I believe, is a country like Fiji is prone to government by coups and countercoups.” A career US Embassy employee indicated that many diplomatic experts shared this theory and noted (as we did) that outside of Suva, no one seemed to care. Tourism – the number one driver of the economy - dropped 40% in the two months following the clampdown. That was not the intention of the government, which devalued the Fijian dollar 20% to attract visitors. We could not spend more than $2.25 for a metered cab ride to anywhere in the sprawling city of Suva. Four cucumbers or 10 baby eggplants for 50 cents. $15 tops for a nice piece of clothing or pair of shoes. Resort visitors – including a pair of very devout Orthodox Jewish newlyweds from Brooklyn - crowed about their great tour packages. So, if you don’t mind a long plane trip, we would tell you – after seven weeks there - that Fiji is THE place to come for a vacation in the South Pacific. It’s cheap. It’s very beautiful. There’s plenty of cultural interest. The weather – especially on the west side – is lovely (read, sunny and not beastly hot). No mosquitos, no “Bali belly” (down under for “la turista”), excellent transportation and communication systems, a resort to suit every budget and interest, and the friendliest, most helpful people we’ve encountered.